It'll be difficult to find a better gift for Him. Beauty comes from within - true - but a Signature Haircut or a Classic Hot Towel Shave will make most men truly feeling better - inside n' out. Combine Hair & Beard treatments for an even better experience (...and save a bit of money too)! The Gift that keeps on giving. 5 Classic Haircuts should be able to keep any man looking sharp for the rest of the year! Specialized in Men’s hairstyles. Classics, temporary and futuristic. Our Classic Haircut includes a consultation, hair wash, cut, style and neck shave. The choice of most customers and perfect for our regular customers. Henri’s Signature Haircut includes a consultation, cut, style, neck shave and wash your hair both before and after your haircut. The Signature Cut gives us more time to discuss your style, for a better result! Messy facial hair watch out! We're got years of experience in beard grooming, and we are constantly trying to rethink our techniques for the benefit of your beard. Our traditional Henri beard trim. Your barber will sculpt and shape your beard and use blades to tighten up your neck and cheeks after applying oils, hot towels and fat foam. Take our word for it - you'll get addicted. Want to get rid of the beard or unwanted stubble? We will prepare your face for the shave with steaming hot towels and lather your face in thick shave foam. With a sharp blade we'll liberate your skin. Your barber will use his blades to make your scalp free of its follicles. Any long hair will be trimmed down and your head lathered in thick foam to ease the ride. Oils and hot towels will completes the journey! Close your eyes and relax under the steaming hot towels, followed by a soothing face massage with enriching oils. 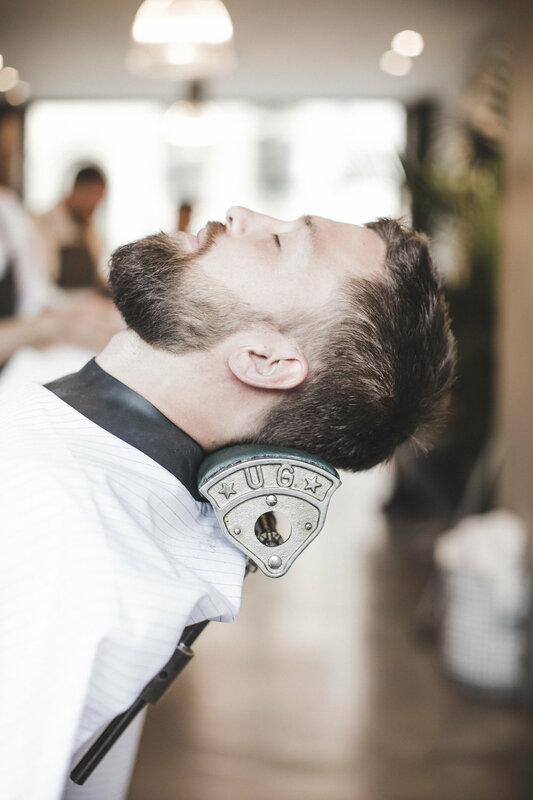 Your barber will sculpt and shape your beard, lather your face in thick shave foam and clean up all edges. You beard will finally be treated with natural oils and styled with the right products. (60 min.) Your face is prepared for the shave with steaming hot towels, followed by a head and face massage. Your face is lathered in thick shave foam, for a better shave. With a sharp blade we'll liberate your skin and afterwards treat it with oils to minimize the risk of red spots and nourish your skin. Had a rough night? Our hangover treatments includes a thorough hair wash, a face massage, a nap under steaming hot towels, and one of Henri’s signature treatments of your preference. The perfect cure for a nasty hangover. The treatment includes a consultation, hair wash, cut, style, neck shave and a nap under the steaming hot towels, followed by a face massage. We'll be gentle with the trimmers, to spare your head for any unnecessary stress. Had a rough night? Our hangover treatment includes a thorough hair wash, a face massage, a nap under steaming hot towels, and Henri’s signature wet shave. We’ll bring you plenty of water and an aspirin. The perfect cure for an ugly hangover. Had a rough night? Our hangover treatment includes a thorough hair wash, a face massage, a nap under steaming hot towels, and Henri’s signature beard trim. We’ll bring you plenty of water and an aspirin. The perfect cure for an ugly hangover.